Located on a cul-de-sac in Verano at Barton Creek, this stunning soft contemporary home takes full advantage of the terrain as it terraces towards the front entry foyer. 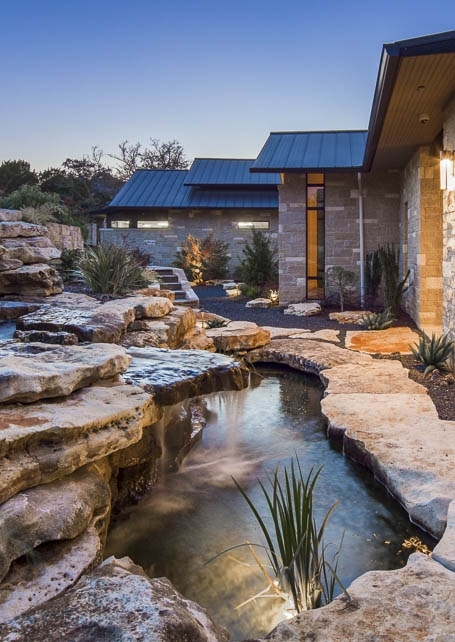 Featuring a Standing Seam Metal Roof, Texas Grey Lueders and White Limestone, this home has been awarded the 2015 Home Builders Association of Greater Austin MAX Award for Best Custom Design over $1 Million and Best Custom Spec Home. Architecture by Cornerstone Group. Interior Design by Laura Britt Design. Our Hill Country Traditional home was honored as a finalist for the 2014 HBA of Greater Austin MAX Awards for Best Custom Home Design. 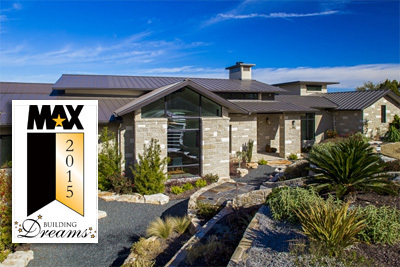 Our Bee Cave Contemporary was named a finalist for the 2013 HBA of Greater Austin MAX Awards Best Custom Home Design. Finally, our New Mexico in Austin home was recognized by Austin Energy with their prestigious 5 star Green Building Energy Rating.